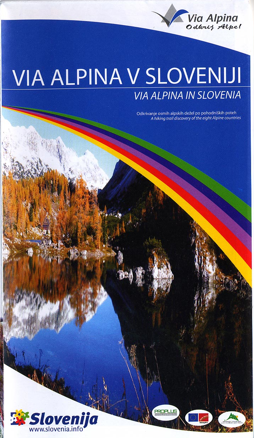 You will find below all maps and brochures realised by the Via Alpina National Offices. Click on the links in order to request them by e-mail directly from the relevant secretariat. Overview map of all trails with specific information on the 58 stages in Switzerland and Liechtenstein on the back. Available free of charge from the National Secretariat for Switzerland or Liechtenstein (in German, French and English). Overview map of all trails with specific information on the 40 stages in France on the back (incl. the list of recommended accommodation structures). 2011 release. Downloadable here (PDF 4.5 Mb) or available free of charge from the French National Secretariat (in French and English). Overview map of all trails with specific information on the 100 stages in Austria and Germany on the back. Downloadable here (PDF 2.5 Mb, in English o in German) or available free of charge from the Austrian or German National Secretariat (in German or English). A series of extracts of 1:50.000 topographic maps covering all Via Alpina stages in Slovenia; with a list of specialized hiking hotels. In Slovene and English. 9x20 cm (2 folded maps), 10 €, published 2009. Available from the Slovenian National Secretariat, in tourist offices along the way and in the country’s major bookshops. Overview map of the 40 stages in France on the back, with general information and tourism suggestions. 2012 release. Downloadable here (PDF 1.5 Mb) or available free of charge from the French National Secretariat (in French and English). Overview map of the 22 stages in Slovenia, with general information and tourism suggestions. Available free of charge from the Slovenian National Secretariat (in Slovene and English). Schematic maps and descriptions of the first kilometers of the Via Alpina from Monaco to La Turbie and three other hiking routes of a few hours starting in Monaco. Available free of charge from the National Secretariat of Monaco (in French and English). Brochure “Via Alpina and Ruperti trail"
The long distance hiking loop through 5 National Parks and 3 countries”: presentation of the Triglav, Gesäuse, Kalkalpen, Berchtesgaden and Hohe Tauern National Parks and of the Via Alpina stages linking them. Downloadable here (36 p.) in English - PDF 10 Mb, German - PDF 10Mb or Slovene - PDF 26Mb, or available free of charge from the Austrian or German National Secretariat. General overview of Via Alpina and detailed description (with schematic maps) of the 3 stages in Liechtenstein. Downloadable here (PDF 1.4 Mb) or available free of charge from the National Secretariat of Liechtenstein (in German only). 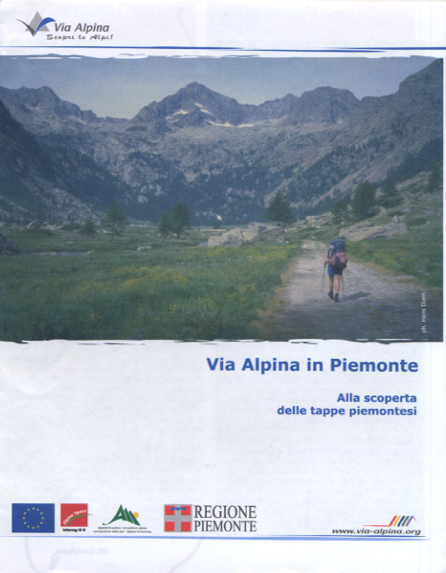 Leaflet “Via Alpina in Piedmont: Discovering the piedmontese stages"
Regional map and description of the stages of the blue and red Via Alpina trails through Region Piedmont. Available free of charge from the National Secretariat of Italy (in English, Italian or French). Leaflet “Via Alpina - Val di Fassa"
Regional map and description of the stages of the yellow Via Alpina trail through the Trento province. Downloadable here (PDF 0.7 Mb). A detailed presentation of the 13 stages of the section of the Red Trail along the border between Lombardy and Graubünden (stages R71-R83 from the Stelvio pass to Pian San Giacomo) including maps, practical information and places of interest. Download it here (PDF – 12,5 Mb) or order it for free from info@valtellina.it (only in Italian). Also available for download is a catalogue listing some 15 organised hiking tours along the Via Alpina in Valtellina (PDF - 6,4 Mb).